Classification in psychiatry is heavily dependent on clinical symptoms and illness course. This ignores the critical role that cognitive problems play in neuropsychiatric disorders affecting different domains across the lifespan, from ADHD and autism to schizophrenia and Alzheimers disease. At this point, it is unclear whether cognitive mechanisms are specific to disorders, whether multiple processes can contribute to the same disorder, or whether aberrant neural processing can result in many different phenotypic outcomes. Understanding this would allow us to better grasp normal as well as pathological brain function. This could inform diagnostics based on understanding of neurophysiological processes and the consequent development of new therapeutics. Genetics, and the development of genomic research, offers real opportunities to understand the molecular mechanisms relevant to cognition. 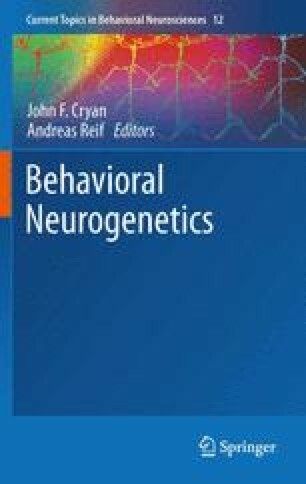 This chapter defines and describes the main cognitive phenotypes, which are investigated in psychiatric disorders. We review evidence for their heritability and early progress in the field using cytogenetic, linkage and candidate gene-based research methodologies. With high-throughput genomics it is now possible to explore novel common and rare risk variants for psychiatric disorders and their role in cognitive function at a genome-wide level. We review the results of early genomic studies and discuss the novel insights that they are starting to provide. Finally, we review the analysis of whole-genome DNA sequence data and the challenges that this will bring for cognitive genomics research.